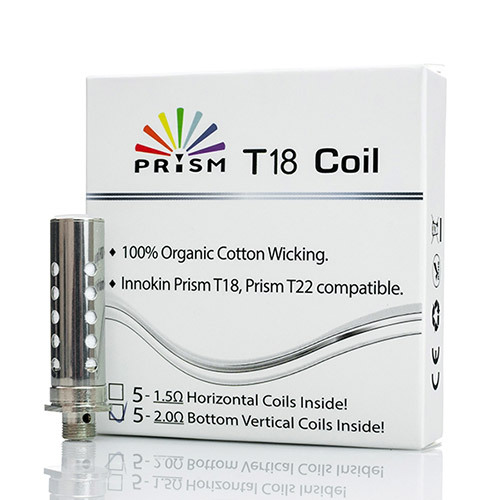 Innokin T18 coils for the Innokin T18 and T18 Prism Tank. These coils are 1.5 Ohm and design specifically for the Innokin T18 2.5ml tank, T22 4ml tank and T18E TPD compliant 2ml tank. Best performance is 14 watts. The product was as described and works perfectly. The service from Vapourmate was superb with the coils arriving very quickly after ordering. Will definitely use Vapourmate for future purchases. Good product, fair price and quick delivery. This was a second visit/purchase. This time after ordering, id made a mistake with my order without realising. I was contacted to check on this before sending out. I was happy they did. Really fast delivery. Definitely be using vapourmate again . Item as described! Super quick delivery,would definitely recommend vapourmate,ordered a few times off them and will continue to purchase from them,many thanks. Exactly what I wanted and at a good price. My first order with this company was delivered free of charge with two working days. Well packaged and great quality. I have since placed another order, which also arrived in two days. Great company which I will continue to use, and recommend.